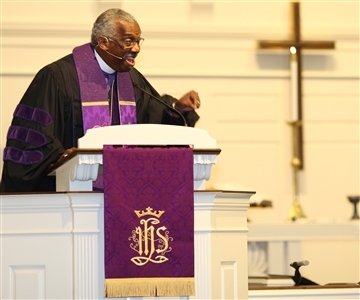 Florida AME Bishop Adam Jefferson Richardson Jr. leads prayer service at Trinity UMC, Tallahassee, to kick off the 2014 Florida Advocacy Days event. Photo by Rev. Armando Rodriguez Jr.
Rev. 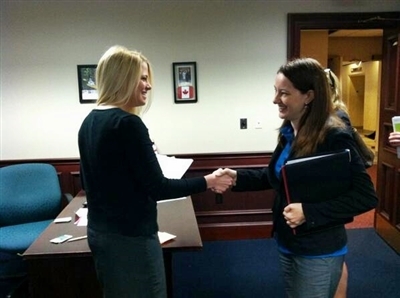 Beth Bostrom, right, Wesley campus minister at the University of Miami, meets with a legislative aide to talk about reforms needed to help children in Florida. Photo by Pam Garrison. TALLAHASSEE – More than 75 members strong, a contingent organized by the Florida Conference took its compassion for kids and others living in poverty to the state Capitol today to press lawmakers for reforms that would expand health care and combat a growing problem of human trafficking. Joined by representatives of the African Methodist Episcopal (AME) Church in Florida and its nonprofit advocacy partner, Florida Impact, the Florida Conference group visited with senators and representatives to give voice to those with little influence over government policies. Rev. Juana Jordan, pastor of Harris Chapel UMC, Oakland Park, was a first-time participant in Florida Advocacy Days (FAD), a conference-sponsored, three-day event that dovetails with Children’s Week. After being briefed on key issues Monday, she made personal visits today to the offices of three lawmakers. Despite encountering resistance to her presentation from some legislators, Jordan said in a phone interview that she plans to be part of the advocacy effort in the future. “I believe it is imperative that I have a seat at the table,” she said, adding that she represents people in a congregation that would benefit from the initiatives supported through FAD. Specifically, this year’s effort supported bills that would expand Medicaid eligibility, remove a five-year waiting period for immigrant children with lawful residency to qualify for Florida KidCare and beef up protection of children subjected to human trafficking. Bishop Ken Carter of the Florida Conference and Bishop Adam Jefferson Richardson Jr. of the 11th District AME Church met with Senate president Don Gaetz. District superintendents, pastors and lay members were among others who met with legislators or their aides. Jordan said she was excited to see the church speak out for people in need. She would like to see the conference increase preparation time for the event to include more tips for dealing with policymakers deluged by emails opposing aid to impoverished people. “As a faith body, I would like to see us attack it spiritually on the front end with a lot more prayer,” she said. 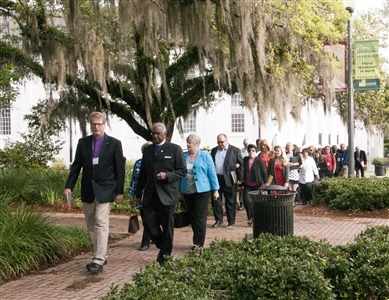 Bishop Ken Carter of the Florida Conference, left, and Florida AME Bishop Adam Jefferson Richardson lead Florida Advocacy Days participants in the traditional walk to the Capitol. Photo by Rex Adams. But even in cases where a lawmaker did not seem supportive, Jordan thought she sowed some seeds of good will by offering prayers to help in future decisions that affect children’s welfare. “We did feel we connected with them,” Jordan said of the experience. She said she plans to reach out to sister congregations in South Florida and encourage them to advocate on issues that affect people in the communities they serve. Rev. Audrey Warren, pastor of Branches UMC, Florida City, said the advocacy issues on tap this year are of critical importance to people her congregation, which includes many immigrants. She said nearly three-quarters of her flock are younger than 18. Warren was also a first-time FAD participant. She said the issues chosen for advocacy don't just affect young Floridians in general but young United Methodists. "We're talking about our own children who take our communion and whom we baptize in our own United Methodist Church," Warren said. As someone who works with youth, Warren said she was especially pleased to see members of the appointive cabinet participating in the event. "I think all people who work with children felt affirmed and uplifted by their presence," the pastor said. Pam Garrison, who helped coordinate FAD this year, said she was most impressed by the role children and young people played in the event. She said she heard personal stories from children who had been in foster care and was encouraged to see young adults active in state government and as advocates for social justice causes. She said one group of Florida Conference advocates was excited to sit in on a committee meeting in which the human trafficking bill moved forward in the House. The bill, which provides for more specific screening and assessment of sexually exploited children before placing them in foster and recovery programs, was scheduled to be heard today by the Health Care Appropriations Subcommittee, according to media reports.